We’d love your help. Let us know what’s wrong with this preview of A Buddhist Bible by Dwight Goddard. A wide selection of readings from Pali, Sanskrit, Chinese, Tibetan, and modern sources intended to provide the reader with a foundation in classical Buddhist thought. The first book to bring together the key texts of modern Buddhism. In the last hundred years, the world, especially the West, has increasingly embraced the teachings of Buddhism. A modern Buddhist Bible is the A wide selection of readings from Pali, Sanskrit, Chinese, Tibetan, and modern sources intended to provide the reader with a foundation in classical Buddhist thought. To ask other readers questions about A Buddhist Bible, please sign up. I am new to this How do I accutually read this? I get that it's foundational for studies of buddhism in the west, but a lot of the translations are pretty archaic... Just because you put "Bible" in the title doesn't mean you need to model your style on the King James version. This isn't the most amazing collection, or the best translation, but for historical impact this gets an extra star. Definitely a great intro to the concepts of Buddhism, with a simplicity and sincerity that more modern translators sometimes lack. I carried this book everywhere I went for years. It slowly fell apart, but by then I had absorbed all I could and it felt good to part with it. Dwight Goddard's collection of Buddhist Sutras and related texts, first published in 1932, is available in paperback with introductions by Robert Aitken and Houston Smith. The importance of this book lies in its role in the development of American Buddhism as well as, of course, in the texts themselves. Dwight Goddard, according to Aitken's introduction, was an enigmatic figure with training first as an engineer (where he became wealthy as a result of an invention) and as a Christian minister. In the latter role, he travelled to the East and became interested in Eastern Religions -- a seeker in the true sense of the term. In the 1930s, while in his 60s he produced this collection of texts, many of which he translated himself, which give a broad view of the nature of the teachings of Buddhist schools. The book helped teach Buddhism to Americans beginning in the 1930s. In the 1950s, Jack Kerouac, then living in San Jose, California discovered Goddard in the public library. He carried the book with him wherever he went and used it as the basis of whatever knowledge of Buddhism he had. The beats in the 1950s were one of the sources leading to the growth of American Buddhism, and Goddard's book was Kerouac's teacher. The main value of this book, though, is not in its role in Buddhist history in the United States but lies in the texts themselves. Goddard presents in one volume a selection of primary source materials from the Theravada, Manayana, Zen, Tibetan, and other Buddhist traditions. Many of these texts have been more recently translated, but the translations in this book are readable, at the least and they are all in one volume. They are not easy reading and will require many rereadings, but they do present a compiliation of basic Buddhist materials for those wishing to benefit from them. My own familiarity with Buddhist texts is primarily with the earlier texts in Theravada Buddhism. This book is comparatively light on Theravada texts but gave me the opportunity to read the texts of other Buddhist Schools. "A Buddhist Bible" remains a fine anthology and is of historical interest for the transmission of the Buddha's teaching to the United States. I have found that many people interested in Buddhism restrict themselves to the practice of meditation or to books setting out Buddhist teachings rather than availing themselves of the original source materials. This book is a great way to read the original texts. There will be something of meaning in them for you. 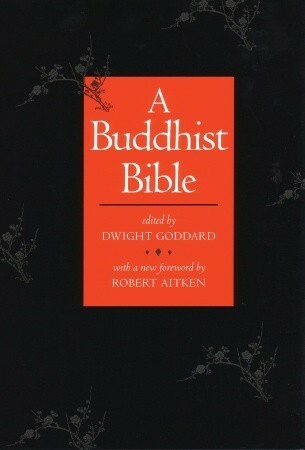 A Buddhist Bible: The Favorite Scriptures of the Zen Buddhist Sect (English Edition) by Dwight Goddard. The only reason to read a book like this is if you're interested in Buddhism. It contains The Diamond Sutra, the Sutra of the 6th Patriarch, the Lankavatara Sutra and a Preface on the history of Zen or Chan, as it's called in China, Buddhism by Dwight Goddard. The Kindle edition is a selection from a much earlier book. The translations were done back in the 1960s. It's not clear whether the su A Buddhist Bible: The Favorite Scriptures of the Zen Buddhist Sect (English Edition) by Dwight Goddard. Excellent set of translations from original sources. If you want to understand the foundations of Buddhism, this is the book to read. Translations are clear and complete. I actually read this book twice. This was an excellent book. Very informative. I would recommend this book to anyone that wants a straightforward understanding of Buddhism. Comprehensive and compelling; however, a bit muddled and convoluted in translation. Of course, a laborious and wonderful endeavor to bring Gautama's life and work into the American Lexicon. At about 700 pages, this is a huge corpus of Buddhist sutras and other related writings. It gets dry and repetitive at times, but pulls from traditions and schools spanning thousands of years. If you want to understand how Buddhism has evolved since the days of the Awakened One himself, this is a good place to start. This work was much too dense to summarize in a single review, so I'll just include some first impressions. I had a basic college/university level understanding of Buddhism before, bu At about 700 pages, this is a huge corpus of Buddhist sutras and other related writings. It gets dry and repetitive at times, but pulls from traditions and schools spanning thousands of years. If you want to understand how Buddhism has evolved since the days of the Awakened One himself, this is a good place to start. This work was much too dense to summarize in a single review, so I'll just include some first impressions. I had a basic college/university level understanding of Buddhism before, but never really went beyond the basics you get at that stage: historic timeline of the Buddha, well-known doctrines like nirvana, eightfold path, etc. Reading just a little more in-depth, I can see how this broad overview has led to some common misconceptions in the Western educated mind about what Buddhism actually is. -Selfish or obsessed with the Self: Almost every sutra, whether attributable to the Buddha himself or not, emphasizes the importance of compassion and kindness toward others. Compassion IS the means toward enlightenment. The dismissive idea of "navel-gazing" monks who don't care about the physical needs of others is a gross oversimplification. -Focused on Nothingness, or the Void: Nirvana is an incredibly complicated idea that is far more than just mental annihilation. In several places the Buddha himself specifically states that those who think this have completely misunderstood his teaching. Again, there is far too much to get into in a single review, but Nirvana =/= Nothing. -Atheist: This is a somewhat more nuanced mischaracterization. I've read many arguments that go back and forth on whether or not Buddhism is "atheist." In true Buddhist, non-dualistic fashion, I think the answer to this question may be that it both is, and is not. It's true that Buddhism has no "supreme being," and Buddha is not a god. But Buddhism has historically been open to the idea of supernatural beings and concepts, often incorporating the cultures and societies it has existed in. From what I've read, it might be safer to say that Buddhism is compatible with atheism, but also with theism. -Fatalist: Karma is not some nebulous force or fate-driven destiny. It translates into "action," and is just another word for how our own actions influence the world around us, often in unforeseen ways. -individualist: The Buddha's wisdom and insight is achievable through the mind alone. There is constant emphasis (even in Mahayana sutras) that YOU are responsible for your own enlightenment. -empirical: Many of the Buddha's key insights were made simply by observing life and meditating on the results--life is suffering, our own desires lead to suffering, etc. Some of these ideas seem like cheap pop psychobabble now, but keep in mind, he came up with these points 2500 years ago. Bland self-help authors are (poorly) copying him, not the other way around. -compassionate: I already mentioned this above, but it's worth bringing up again. Buddhism is heavily focused on the well-being not only of yourself, but everyone around you. This ties into the idea of Karma above: when you treat others well, this changes the world--literally. Every kind deed leads to a gentler, better, safer world for all, even if only in tiny increments. -non-dualistic: Aside from compassion, the idea of non-duality was probably the one other concept that continually emerged in all the writings. Becoming too attached to dichotomies can lead to suffering and ignorance. Life is often too complicated to fit everything into a good/bad, yes/no framework, and trying to force this interpretation will only lead to more problems. When reading this book, it is also important to remember that there really is no such thing as a "Buddhist Bible." This term is more of a convenience for Western minds which may have nothing else to compare this collection with. There are thousands of sutras, some of which have never been translated, and of varying levels of acceptance within the Buddhist community worldwide. The closest you might get to a "Bible" in Buddhism would be the Pali canon, which are the oldest sutras, written soonest after the Buddha's death. Even then, this still assumes that Buddhists think of sutras in the same way that Christians think of scriptures, with an emphasis on who wrote what book, when, how "inspired" it was, etc., all of which is superimposing one religion's values and ideals on another's. Don't fall into that trap! I've had this near my bed for months now. I read it all the goddamn time, especially the first bit, which is a collection of a number of the Pali texts glommed together to give a sensible presentation of the historical Buddha's actual teachings. The title irks me to no end, though. Got it to read the Diamond Sutra. Liked some of the explanatory text. Some authors caught my eye, and some others didn't. Wonderful collection of Buddhist thought, in a concise and easy to read format. This was a favorite of Kerouac. another book used for reference that i have not read from cover to cover. this collection of sutras hasgifted me new insights into living life and the nature of reality. the actual words of the buddha... or supposedly. Fantastic book to observe the roots of different kinds of Buddhism with. Zen literature presents some fascinating philosophy, even if you're not a Buddhist.